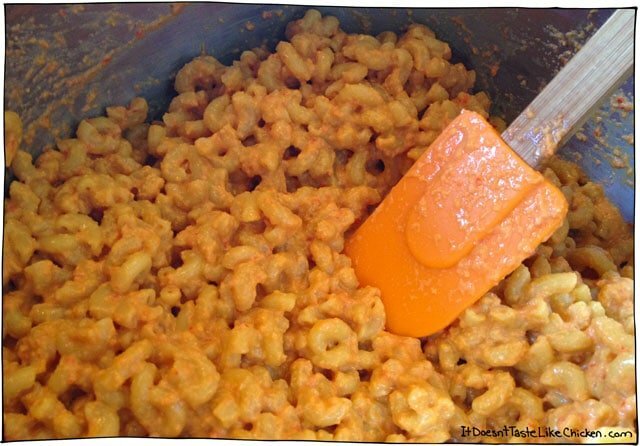 Not the fruit, or the carrot, probably the third most notably orange food, Kraft Dinner! 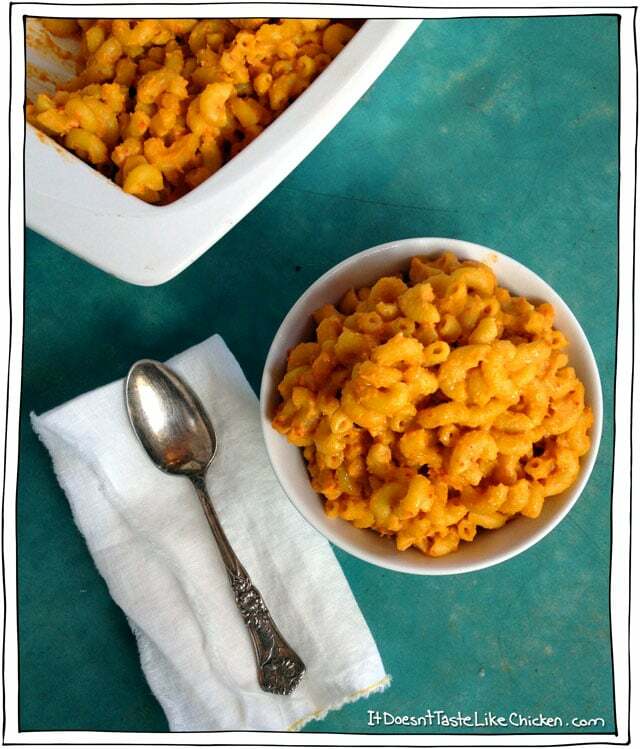 Or if you are American, I believe it is formerly called Kraft Macaroni & Cheese. Yellow 5, and Yellow 6, oh how you woo me with your neon glow. This chemical laden “food” is probably one of the farthest things away from health, but admit it… you secretly have a soft spot for it. I remember the times when I was first old enough to stay home alone. It would always be a kraft dinner night for me! My mom never fed me the stuff, so it would be a secret (not so secret) victory of being on my own. I felt really talented too. Learning how to balance the cheese powder ratio to the milk and butter ratio, so very proud of myself… Early cooking you might say. Well, at least I knew I wanted my noodles al dente! Luckily for us, there is no need to give up your favourite orange noodle dish. Throw the KD in the trash, because there is a new orange kid in town. This orange kid is gonna like your body a whole lot more too. No dyes here, the colour comes from red bell peppers. Yeah I know, imagine that, vegetables providing colour to a meal. There is also no gluten (for you gluten free fans), and not even any oil! 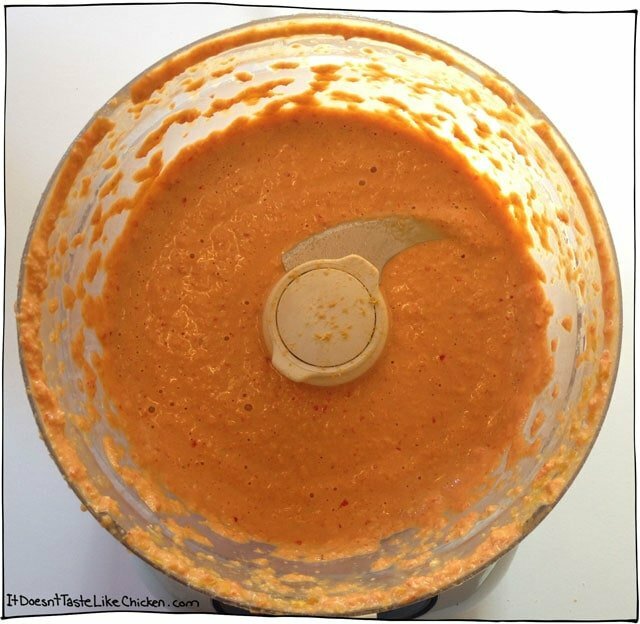 Instead I made a creamy tangy sauce with all sorts of fresh, healthy ingredients and delicious flavours. The best part? 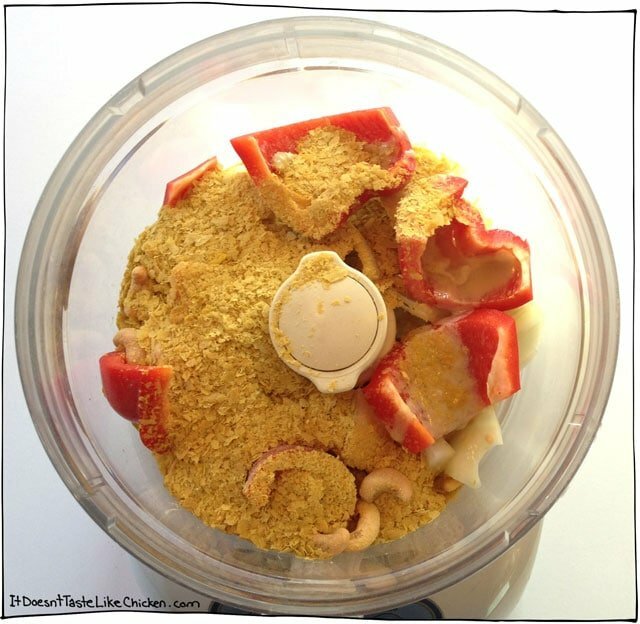 All you have to do is toss everything in your food processor or blender, and then mix with the cooked macaroni. That’s right, it actually takes about the same amount of time to make as the boxed junk! Welcome to guilt free, golden noodle goodness! I did the recipe in your cookbook and it was great, but now I am wondering if this one would be better. Hmmm….do you have a preference? I want to make this for my in-laws this weekend when they come to stay but there’s a citrus allergy. What would work in place of the lemon juice ? Vinegar? The lemon is for flavour so you could sub vinegar to taste if desired. Haha, if people can be vegan with soy allergies, then they can be vegan with lemon allergies! Haha. Enjoy! This recipe maybe older but I’m adding it to the “Family” cookbook. 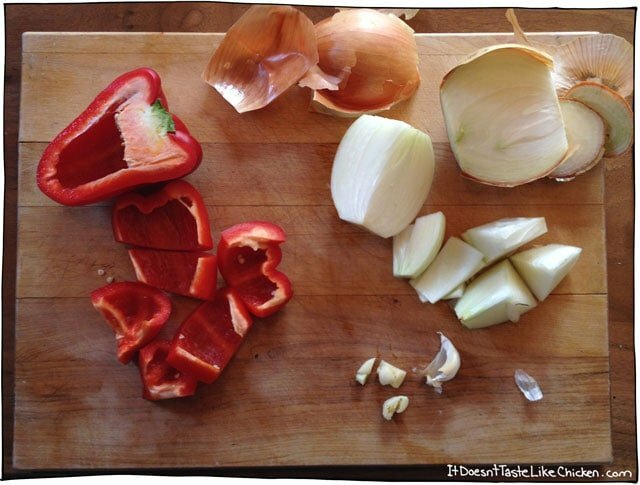 I did use an extra garlic clove and will “peel” my red pepper but that’s my likes. Got some picky little ones that might call me on the carpet for the peel of the red pepper. Gosh, this is a keeper! So happy you enjoy it, Irene! Hi Sam, quick question, would soaking the cashews in hot water for 15 min o rover night help to make the cheese sauce creamer? Was watching a video of another recipe, much different than yours, but used a lot of oil and salt. Like yours better, Just wondering about the cashews. Thanks! and ya, a printable for this recipe would be great. YAY! SO happy you loved it, Krista! Can I make this if I’m out of bell pepper? The bell pepper not only adds flavour but it adds the orange colour. So if you make it, it will just be a bit different in taste and look. 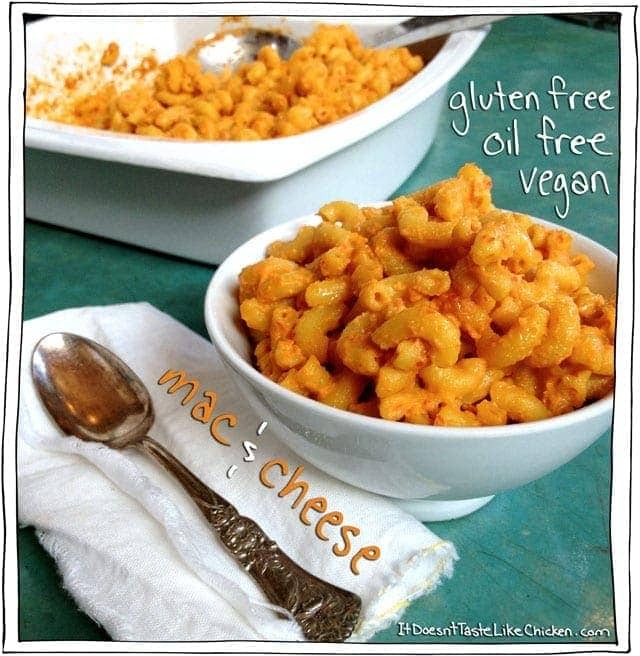 Ok I was super skeptical, it looked too simple and i’ve tried so many other vegan mac and cheese recipes. But this is the best one yet and its so easy to make and in no time at all! If your thinking about trying this, stop thinking and go make it. I think the only adjustment I made was an extra clove of garlic since i’m obsessed with garlic but thats it. why not have a PRINT button, and option not to print pictures? That would be so nice, adn save ink too. thank you. Holy crap. That was so good. So, so, so good. I don’t even know what else to say…. Hahaha! I think you said it perfectly! I’m eating this delectable dish as I type. Thank you for the simple, yet creative ways to convert the typical American diet entrees into something far healthier and great tasting at the same time! 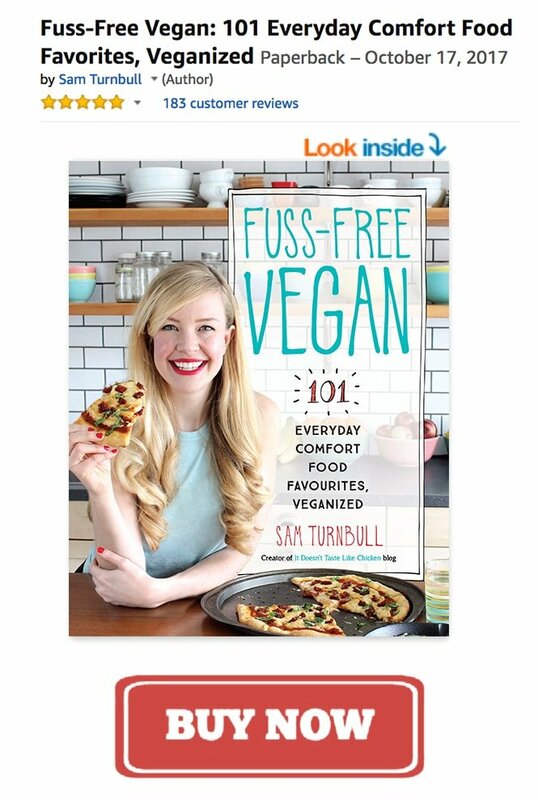 I just made this recipe for my very anti-vegan family…. And they really enjoyed it! 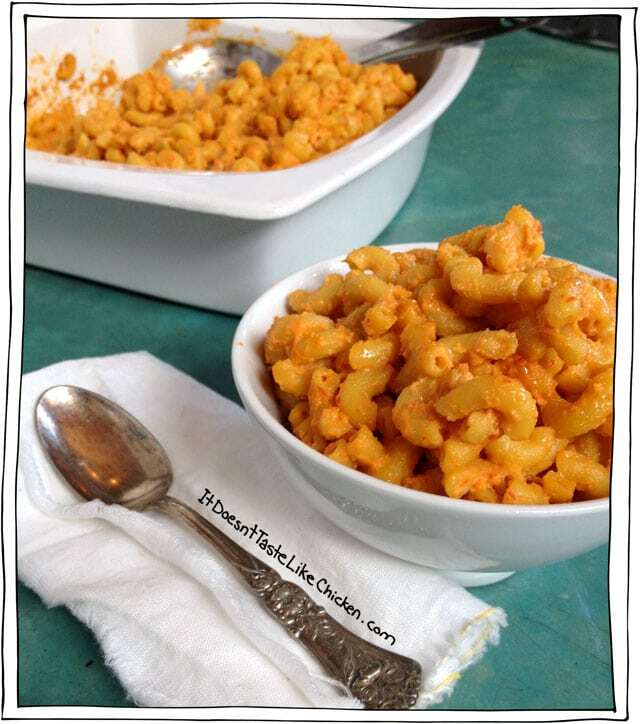 Lovely creamy sauce, really hits the spot when you’re craving something solid on a rainy day. Thank you!! Not a recipe for a veggie hot dog, but quorn do a pretty good hot dog, pretty sure it’s vegan, but it’s definitely veggie. My husband who is a committed carnivore prefers them to the meat ones. I’ve never tried Quorn products, as they don’t sell them in Canada, but I love that your husband prefers them! Quorn isn’t vegan as it contains eggs, and probably not even vegetarian either since it was tested on animals when being developed. I’m vegetarian and eat a lot of vegan food too, but won’t touch Quorn. Thanks for the tips Eibhlin! I just checked the Quorn site, and you are right, they do contain eggs and milk and are not vegan. I did see that they are planning to launch a new vegan line of Quorn products very soon! So that’s good news! PS. One of the first meals I ever made was scrambled eggs! I used to eat them for breakfast every chance I got. Strange to think I can’t even down them at this point! I guess I’d say popcorn with lots of butter! Oh my, I loooove popcorn! If you want to health it up, make stove top popcorn with just a bit if oil, and the toss on seasonings, like this: https://itdoesnttastelikechicken.com/2013/10/14/cheezy-vegan-popcorn/ Nutritional yeast is..well, nutritional! Way better than butter. Oh pop tarts! That’s a good one! Pop tarts helped me get through my last day of my masters. Haha. You are inspiring me…. Time to make a healthier pop tart I think! If anyone has found the perfect veggie dog, be sure to leave us a comment and let us know!